President-elect Donald Trump's pick for Treasury said Wednesday morning that the new administration will prioritize tax reform, but that it won't result in a tax cut for the rich. "Any reductions we have in upper-income taxes will be offset by less deductions, so there will be no absolute tax cut for the upper class. There will be a big tax cut for the middle class, but any tax cuts we have for the upper class will be offset by less deductions that pay for it," Steven Mnuchin said in an interview with CNBC. 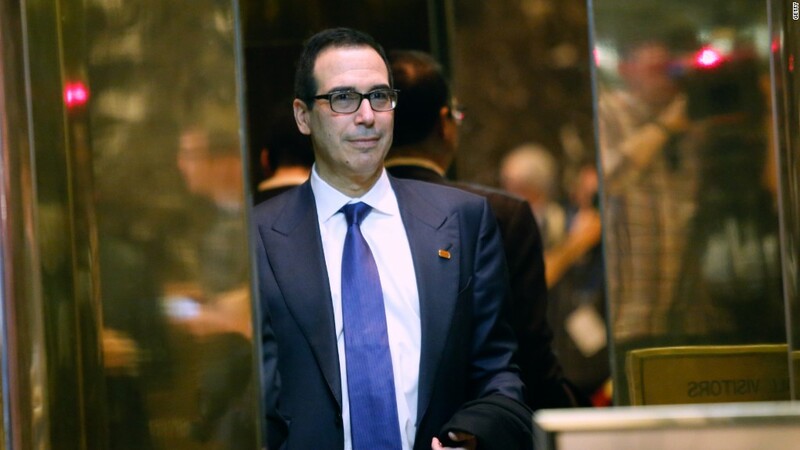 That's a notable statement, because if Mnuchin is confirmed as Treasury Secretary, the former Goldman Sachs banker will be a top player in shaping tax reform. It's also interesting because his description of what reform will look like differs from what Trump himself has proposed. In the latest version of Trump's tax reform plan, everyone would get a tax cut, but the rich would see the biggest cut of all, according to independent analyses. The Tax Policy Center, for instance, found that those in the top 0.1% would see an average tax cut of roughly $1 million. Mnuchin's statement may mean Trump will move further in the direction of the House Republican tax reform plan. As it is, Trump already raised the income tax rates he originally proposed (10%, 20%, 25%) to conform to those in the House plan (12%, 25%, 33%). But he didn't go as far as the House plan in terms of limiting deductions. He proposed capping the value of itemized deductions at $200,000 for joint filers. The House plan gets rid of all deductions except those for charitable contributions and mortgage interest. Mnuchin seemed to suggest on CNBC that that would be the direction the administration will go in. "We'll still let you do charities ... [and] we'll cap mortgage interest but we'll allow some deductibility," he said. It wasn't clear if he'd push to preserve any other deduction. This is hardly the first time an adviser to Trump has said something different than what his boss has espoused publicly. But the idea that the rich may end up paying the same or more in taxes as they do today seemed to be something Trump acknowledged might happen once the tax reform debate gets under way. Last spring, he indicated in interviews with ABC's "This Week" and CNN's "New Day" that he knew his tax plan is "going to get renegotiated. And in my opinion, the taxes for the rich will go up somewhat." But then he later explained he meant tax bills for the rich would go up from what he proposed in his original plan, which included a huge tax cut for the wealthy. Then again, in the same week he also said "The wealthy are willing to pay more. We've had a very good run." So ... everything's negotiable. Maybe taxes on the rich will go up, or at least not go down by nearly as much as he has promised.